Q. Four friends, namely Jagat Narayan, Banarasi Das, Moti Lal and Sita Ram were staying in block ‘A’. Last year in January, they decided to save money during the whole year and travel with that money throughout the country. Their wives also started savings of the four couples in the year amounted to Rs.25000. The four women on their part had saved together three times of the 1/8th of the total saving. 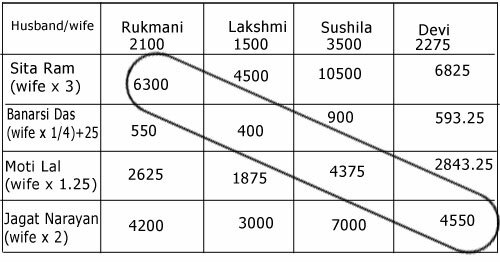 Rukmani had saved 40% more than Lakshmi, Sushila had saved 2/3 more than what Rukmani had saved. Devi on her part had saved Rs.175 more than Rukmani. Among the male friends Sita Ram, Jagat Narayan and Moti Lal had saved 3 times, 2 times and one-and-a-quarter times more than their wives, respectively. Banarasi Das could not save much. He could save only Rs.25 more than the 1/4th of the saving of his wife. Would you please tell how much each couple could save in all. Give their names. Also state which couple saved the maximum. Total savings are Rs. 25000/-. The couple saving maximum is Sita Ram and Rukmani.